Dennis Whalen, a marketing executive in San Francisco, forwards this link to a speech given in 2004 by Malcolm Gladwell, the New Yorker writer and author of the Tipping Point and other best sellers. How do food marketers decide what sells sodas and spaghetti sauce? Gladwell’s answer: in ways that make people happy. Really? In case you missed CNN’s weekend investigative report on America’s obesity epidemic, you get another chance online. I was interviewed for it and appear for 5 seconds right at the beginning. I’m always suspicious of programs that show lots of pictures of overweight people (with heads discreetly cut off); they usually miss key points as well as being insensitive. I’m curious to know what you thought of it. CNN went to a lot of trouble to do all those interviews and all that filming. What did you learn from it? Do tell. The Center for Science in the Public Interest is running a “Junk-Free Schools Video Contest” (see information about how to enter). It invites young filmmakers to make the case for getting junk food out of schools. The winner will receive a $100 gift certificate for iTunes and CSPI will showcase the video on its school foods website. Deadline: November 1, 2007. Get busy! NYU Food Panel Discussions Now Online! 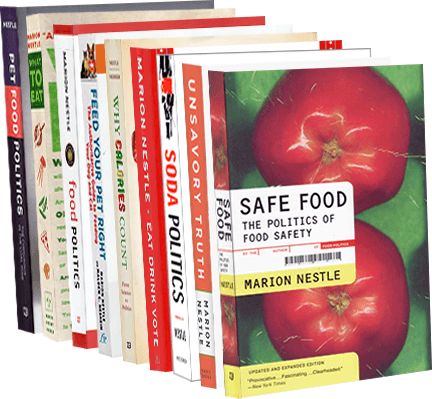 The “Critical Topics in Food” series of panel discussions at the Fales Library at NYU are now online. Enjoy! Those clever film folks who make The Meatrix videos, have a new one out on the Farm Bill. Can’t understand the Farm Bill? Try this–it won’t take long–and see if it helps. It is also at this site. I’m a long time subscriber to Advertising Age, which is just a great source of information about the amounts of money food companies spend on marketing in general and to kids in particular. Thanks to Michele Simon, author of Appetite for Profit, for sending me a link to an Advertising Age video on how food marketers are adapting to their recent promises to stop advertising junk foods directly to kids. Not to worry. They have ways.